The Margate Guide containing a particular account of Margate with respect to its Buildings, assemblies,accommodations,manner of bathing and remarkable places in its neighbourhood, to which is prefixed a short description of the Isle of Thanet in general, and at the end is added a tide table for Margate. 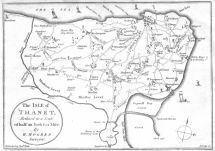 Folding Map of the Isle of Thanet. Hall, J. Bookseller of Margate. In the Kentish Gazette for August 30, 1777 J. Hall advertised his ‘Map of the Isle of Thanet from an actual survey by R. Budgen’ for sale at 5s ‘on fine canvas, in neat cases, for the pocket…. 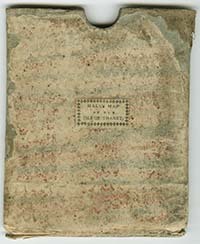 designed as a pocket companion for the Nobility and Gentry in their daily excursions, and a useful piece of furniture for the neighbourhood.’ A third edition was published in 1781 (Kentish Gazette August 29, 1781). Since the map shown here (in part) gives no statement of edition it is likely to be the first edition of 1777. 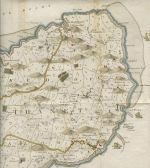 The History and Topographical Survey of the County of Kent: Containing the antient and present state of it, civil and ecclesiastical; collected from public records, and other the best authorities, both manuscript and printed: and illustrated with maps, views of antiquities, seats of the nobility and gentry, &c.
By Edward Hasted , Canterbury, Printed for the author, by Simmons and Kirkby. W.C. Oulton. A Picture of Margate and its Vicinity. Embellished with a Map and Twenty Views engraved by J.J. Shury. A Plan of the Town of Margate from an actual survey made in the Year 1821 by William Edmunds. Scale 1½ inch to 400 feet, aprox. This is the highest scale of the early Ordnance survey maps and covers most of Margate. OS Sheets: XXV4.16-4.19, 4.21-4.24; XXV7.5, 7.9, 7.10; XXV8.1-8.4, 8.7, 8.8. Bacon’s New Plan of Margate. Sold by S. Gahan, Cliftonville Library. [No date, but later than the previous Bacon's Map]. The route of the Isle of Thanet tramway is shown by the broken line, running via Canterbury Road, Marine Terrace, Parade, Fort Crescent, Athelstan Road, Alexandra Road, and Northdown Road to Ramsgate. OS Map of Central Margate, on a scale of 50 ins/mile. The NE section of the map (shown in light grey) is from a later survey. The map is particularly useful in including house numbers. 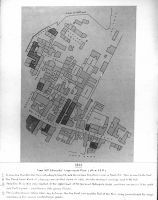 James Brazier of the Margate Civic Society has provided some fascinating information about the two sketch maps, '1821 Edmunds Map: Detail' and '1840: Lower High Street, Margate'. The maps are the work of the late Dr. Arthur Rowe. The originals are part of his bequest now in the Local History Collection at Margate Library. 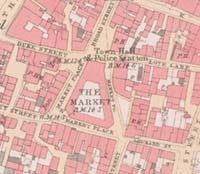 The map of the Lower High Street in 1840 is one of a series he drew, also including maps for 1800, 1820 and 1860, illustrating the trading history of the town. 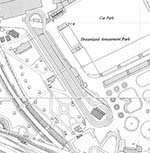 The collection includes a large number of other sketch maps by Dr. Rowe. In asking your acceptance of this map of lower High-street in 1840 I wish you to regard it as some small return for the hospitality extended by your office to me in my researches on Old Margate. Mr Frights great knowledge of our old Rate-books has been invaluable to me. Infinite pains has [sic] been taken to make the map thoroughly reliable, and I am not conscious that it contains any mistakes. I felt that the names in High-street would give some idea of the trade in the town between 1800-1860 in the second period of the towns early expansion, the first being from 1770 to 1800. Accordingly, I have made maps similar to this for 1800, 1820, 1840, and 1860 – a laborious but extremely graphic way of writing the trading history of the town. I may say in passing that I am compiling a list of traders between 1500-1600, 1600 and 1700, and 1700 and 1800. This will make my record fairly complete. The names underlined (six in number) are what I have called “Century-houses” i.e. houses in which the same profession or trade has been carried on for a hundred unbroken years. I started with the idea that I might get six in all in the whole town: now I have over two dozen, and the end is not yet. This alone gives a wonderful idea of the antiquity of the town. The bathing-houses, inns, the famous Library, and the Bazaars are indicated by a different tint. 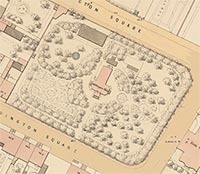 It will be seen that Mr Bobby’s idea of carrying a passage through to Cecil-square is not a new one, as shown by the Boulevard, now Bobby’s Library. Some of the gilded scroll work in the cornice of the Boulevard still remains. Mrs Hill’s house was in what is now known as Albert Terrace, a name dating only from 1868. She was a lady of means (and easy virtue), and her title to fame rests on the fact that she invited the rising young painter, George Morland, to stay with her in 1784. The house was always given as in High-street, and was reached through the still existing opening opposite Bobby’s Library. There was then a wall closing the opening, with wide gates therein, and this was the entrance to her house. Andrews’-place was formerly called Hazardous Row, and in the great storm of 1808 well it merited its name, for there was a yawning chasm 20 ft deep below it, and the houses were hanging by their back walls alone. It will be noticed that the Post Office at this date is at 4 Cecil-square, where the Baptist Chapel now stands, it having previously been on the site of Mr Heath’s toy shop, from 1815 to 1834, when it was kept by Daniel Valder. The Boulevard was built by Emanuel Levey, watchmaker, in 1820, and it came to an end in 1894, Miss Caslake being its last tenant. 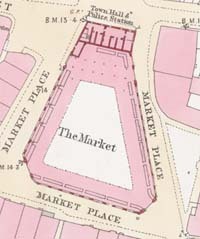 Jolly’s French Bazaar started in 1823, and in 1861 was taken over by Charles Lord, the draper, his carpet warehouse occupying the site of the Bazaar. The London Bazaar (of a much inferior type) began in 1830 and was finally swept away in the High-street improvements of 1880. In its last days it was a saleroom and a workman’s club. No. 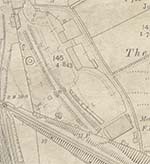 29, on the south side of the entrance to the long passage leading to the London Bazaar, was the Railway Hotel, in 1860, kept by John Keris. Quality Court is our Charles Square. In 1785, James Walker, the first M.C. [Master of Ceremonies] at the Assembly Rooms, dates his advertisements of Bells from “my own house in Quality Court”. The houses (Nos. 160-163) were low wooden structures, with small-paned bow-windows. I can remember them as such. Vaughan’s Library was the famous Garner’s Library of 1789, and previously Joseph Hall’s Library (the earliest in the town) which was opened in 1765. It became the Globe Hotel, in the Rate of 1865, and was pulled down when the Marine Drive was made in 1878. The Bathing-houses have a history. The bathing machine was invented by Benjamin Beale in 1750, but we hear of no bathing rooms till 1763, when they first appear in our Rate-books. They were swept away in the great storm of 1808, and were then rebuilt “in a greatly improved form”. These absurd little wooden houses used to be called “the bird cages” from their squat and square shape. Dr Daniel Jarvis was once the owner of Mr Heath’s property, and he had a clause put in the agreement that these bathing houses (some of which he owned) should not be raised higher than they were at that date. And that agreement still holds good. It is one thing to look as a map, and another to have it explained. I must apologise for the length of my commentary, but my idea was that you would value the gift more if its inward meaning were made apparent.